There was a point in the proceedings when we, the Revolution team stopped and gasped in awe. Out from nowhere, a picture appeared during the presentation, that for the plebeian watch buyer among us, would pass for some metallic contraception, one of the many little complicated parts that one could find in a watch. Yet, there was no mistaking the significance of what had appeared. For anyone with a slightly deeper understanding of the mechanisms that go into making a mechanical watch, this picture symbolised a brave new world, one in which possibilities yet unheard of and familiar at the same time suddenly became reality. This dear friends is the brand new Syloxi hairspring that appeared out of nowhere, and caused jaws to drop when the Revolution team came a knocking at the Rolex booth in Baselworld. I am telling you this in rather a secret manner, because this will probably be one of the things that will pass unnoticed by the vast majority of the watch press. Perhaps Rolex intended it to be this way, because the way that it was chosen to be released into the world, was through a watch that, for all intents and purposes would not be, in anyone’s conception, the way that something as significant as this would be released. Here we have one of the variations of the Oyster Perpetual Datejust Pearlmaster 34, something typical you’d expect to see from the brand’s range of ladies watches. 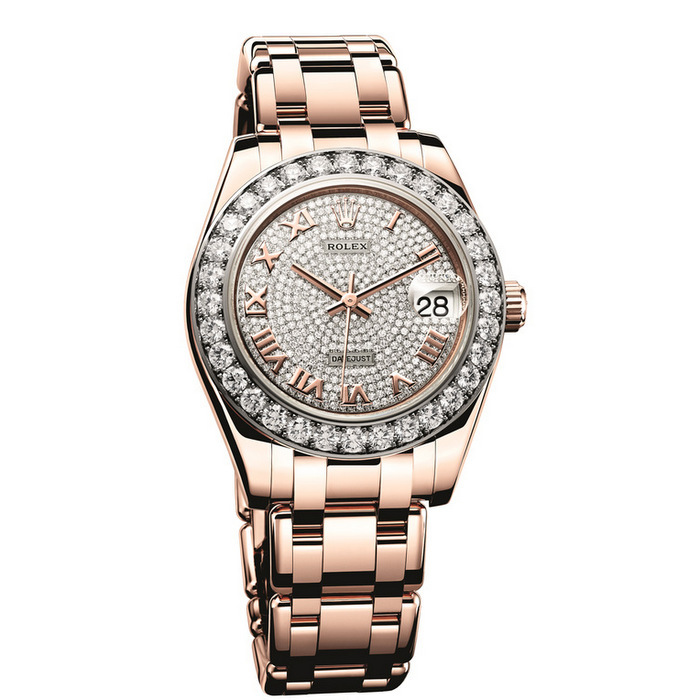 A nice watch for sure, and one that the lady in your life would appreciate as a gift. So far so good. If Rolex had ever made it a habit to have open case-backs on their watches, then this particular innovation I am speaking of might be more obvious and visible, and perhaps would not require the appearance of the picture above to underscore the importance of what was inside. What we have however, hidden within and beating in this watch, is something that could be nothing less than one of the most incredible innovations in watch-making in recent times. Calibre 2263 is the reference number of the movement, and perhaps worth noting and remembering in a way similar to that time you picked up that CD of an unknown band, only to see that your choice would turn out to be one of the biggest and most popular musical acts of the century. 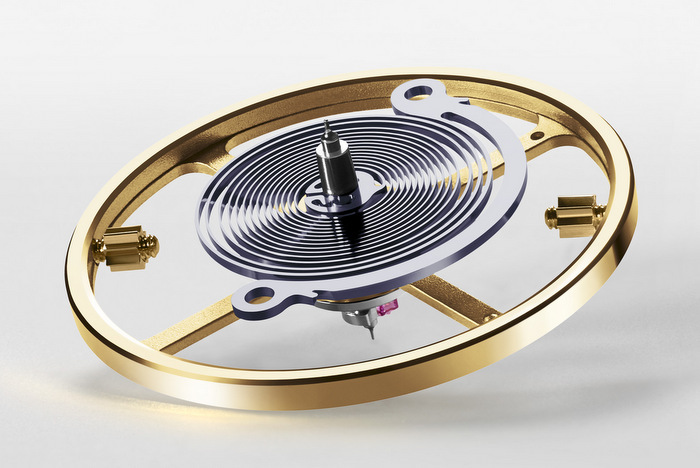 Yes, this is what could happen, for the brand new Syloxi hairspring in silicon developed by Rolex is an innovation both in materials and in the way of how a hairspring is put together and what it can do. On closer inspection, watch aficionados might very well see that something very different is going on here. Most obviously, the thick semi-circular shape surrounding what looks like the hairspring is plainly obvious. Look a little harder though, and trace the lines with your eyes to discover that the hairspring actually terminates in a large and sturdy part with two attachment points, making the entire thing, one whole piece. 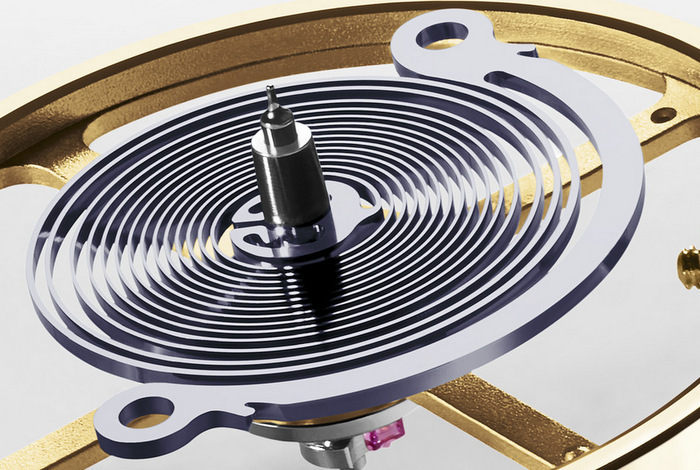 As well, unlike more typical hairspring designs, the spaces between the coils get progressively larger and larger as you move out from the centre, possibly configured in this manner to maximise concentric breathing. This you will know, has never been seen in a hairspring before. “Syloxi” is the name of this new innovation, with the word coming from the materials that it is made of (silicon and silicon oxide composite) and that will probably enter into the nomenclature of watch geeks everywhere. Created to optimize time-keeping performance, this counts as the next significant step up in the integration of silicon into the regulating organ of a watch. Rolex has always had a history of innovation, being the first, if anyone will remember, to ever consider experimenting with silicon for hairsprings in the first place. Silicon after all, has wonderful properties that benefit chronometric performance, being perfectly uniform, having no fatigue life and also being non-magnetic. It’s only achilles heel is it’s unfortunate way of being badly affected by temperature. Yet this was remedied in some manner by Rolex, along with Ulysee Nardin and Patek Philippe, who together, hold the patent for growing a layer of silicon dioxide on the silicon hairspring. This tradition of Rolex to propagate innovations related to performance and durability have of course been seen in others like Parachrom and Cerachrom. Now Syloxi stands at the doorway of entering this group of innovations that for a lesser brand more interested in chasing the next big trend, would not even be conceived. Remember as well that the astounding GP Constant Escapement started life at Rolex when Nicolas Déhon was working there, and was actually tested by the brand. Yet, the idea was too advanced for the technology of the time, and he pursued it later with GP after he left Rolex. If anything, this one anecdote demonstrates Rolex’s commitment to always experimenting with new ideas. So, while hairspring technology lands squarely in super watch geek territory, anyone with half a brain can see from the picture that something significant is going on. With the hairspring ending in a manner where the terminal end suddenly becomes large, flat and held by two attachment points, one can intuitively see that this arrangement will necessarily be more sturdy, stable and balanced. Then with the addition of it’s variable geometry, (that of increasing the distance of the rings moving out from the centre) there might just be enough there for it to surpass the performance of the Breguet overcoil. The other significant detail relates to how the beat adjustment is integrated into the Paraflex shock protection of the balance wheel. We were not able to get the details of how this works, but from the picture that Rolex allowed us to see, (that we are unable to show you), this means that the regulation of the movement can be done easily, with a turn of a wheel (shaped like the Rolex case-back) attached directly to the hairspring. 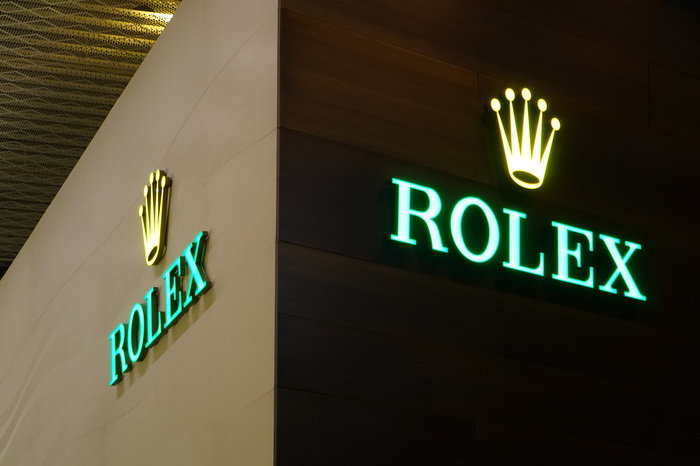 Some might criticise the fact that Rolex has not done much to change the cosmetics of their watches, taking a glacial pace to introduce anything significantly different from what has come before. For that, an ideal metaphor might be to consider that Rolex is like a swan on a lake. Looking at a swan as it glides gracefully along, we get swept by the beauty and the feeling of a gentle relaxedness from the scene. Yet look under the water, or behind the scenes, and you will see the swan’s legs vigorously moving. What happens then behind the walls of the rigorously modern and technically advanced factories of Rolex, might just be a bunch of technologies being worked on by people who will do whatever it takes to improve reliability and durability, and make the best functional watches out there. Will all that said and done, we will look forward to get more information beyond the sneak peek that we were allowed to see. 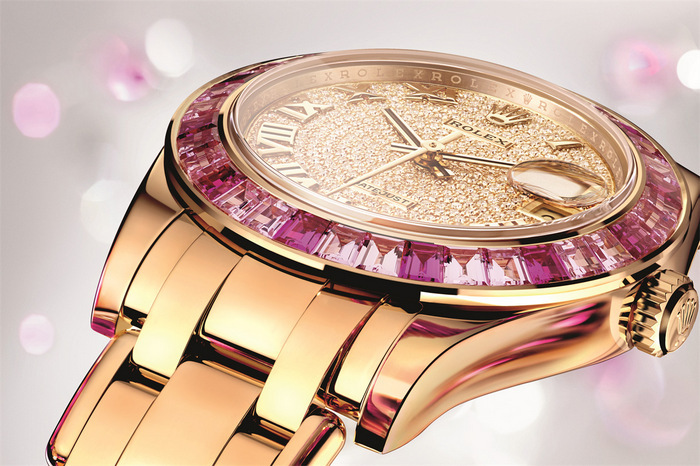 Perhaps now, the question remains as to why Rolex wanted to introduce this innovation in a ladies watch? Strange as well is the fact that it this release has not been highlighted as much as it should be. My best guess: perhaps with this innovation so new, some time has to pass for its performance in the real world to be monitored. It is still C.O.S.C. certified of course, with the rather large calibre at 20mm in a 34mm ladies watch, being placed for tests in the men’s watch category. Who knows? What is certain however is that for the time being, it will be Parachrom only for the men’s watches. 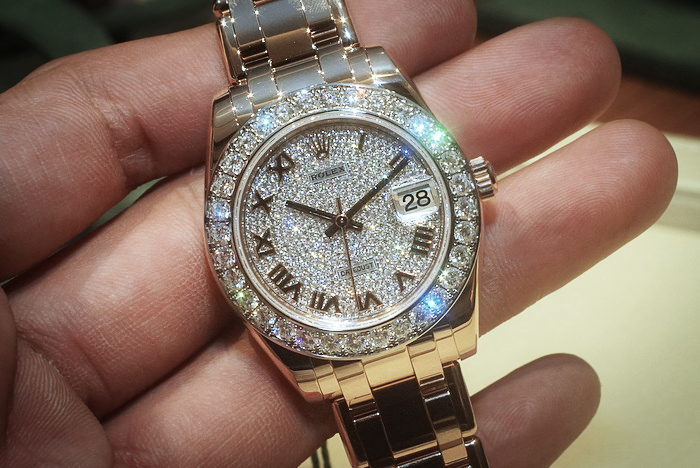 However, with the bank vault solidity of how Rolex goes about doing things, perhaps the time when Syloxi will appear throughout the range will come sooner rather than later.